Being a absolute novice with electrical soldering and the black art. This is how I fitted my DG8 I got from the Motorbike show last week. and Paul from acumen came up trumps with the following. ECU is on LHS under side panel, you have to unwrap the bundle to get to the wires. The dash board cluster is the bundel above that goes off to the Dash board. Soldering was fiddley, especialy since it was my first go at soldering ever !!! I fitted it here on the dash as there was no need to drill to fit it. Nice work for a first attempt. My tip when making these kind of joints: After taping up the soldered connection, gently run the side of the soldering iron tip over the end of the tape. This seals it and stops it from peeling away in the cold weather. I fitted a DG8 to my 2007 ABS 9'er yesterday and thought I'd pass some additional info on for others to use. 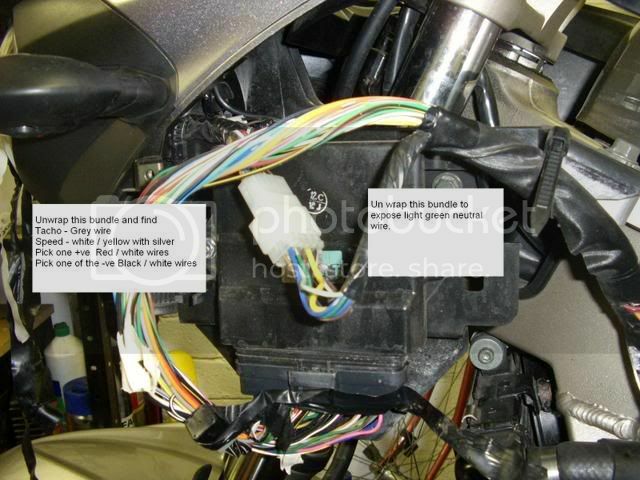 When you look behind the left side fairing panel you'll see more electrical gubbins than those pictured above but the connection table below still mostly holds true. The only difference being the neutral light wire which is no longer light green but is now sky blue (a very light blue). Edited by Baron, 17 March 2008 - 08:54 pm. Agreed, (If any Mods or Admins do not agree just move it back here All About TDM). To KB pursuant to 'fact checking'. Edited by robgosty, 28 March 2008 - 07:39 pm. Better still is to use heat shrink tubing; slide it over the cable, make solder or crimp joint, slide tubing over joint and shrink using a heat gun or hair dryer. You can buy this in different sizes from most electrical wholesalers. 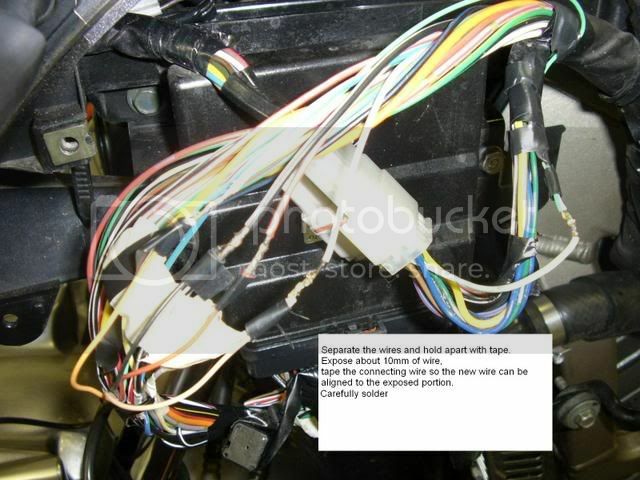 That's the best thing to use when joining ends, but when piggybacking onto existing wiring (as in this topic), you can't fit heatshrink unless you cut the wire you intend to join onto. I prefer not to do that. Surely there's a connector housing where each pin can be removed, soldered to & then re-inserted ? Easy & neat. Edited by TDMtoraneko, 11 April 2009 - 01:10 pm. plus controller & heated gloves for the missus. Oxford v7 Heated Grips, V-Strom 650 HandGuards, Fenda extenda. 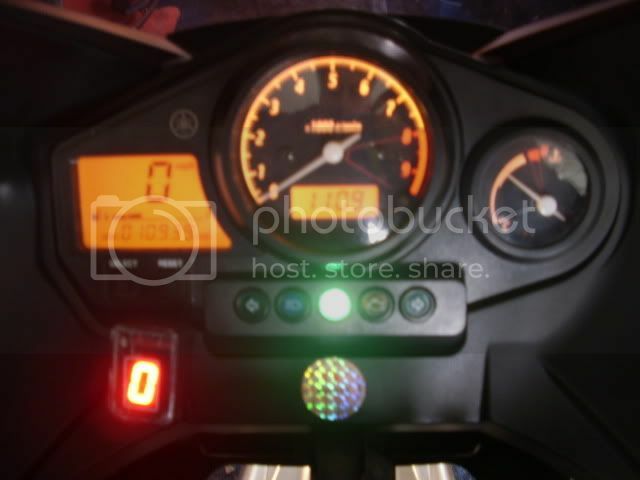 I'm sorry if I sound a bit stupid, but from what I see the only connections are +ve, -ve, tachometer, speed and neutral. How does the gear indicator know what gear you are in? Edited by SpeedDevil, 15 December 2010 - 11:39 am. Why is the LED unit so bloody huge? Surely there must be a slimline version. What do you need a gear position indicator for anyway? I would not be without one now. Its handy going into corners in the right gear, makes the riding a lot smoother and I used to forget to go into 6th gear on the motorway. Ride for miles in 5th. Personal preferance realy . BM fookin W's have them, why not my TDM. It compares the speed with the revs (ie 80 mph @ 4000 revs = 6th gear) - if I remember correctly you have to go through a learning process to set it up. I tried one on a Bandit I used to have but couldn't get a reliable reading - I used to spend my time working out myself what gear I was in then checking the unit. Decided that wasn't the idea and removed it. Farkles - Laser Duo Techs, Power Commander and custom map, Tenere 1200 Handguards, Yamaha Heated Grips, MRA Vario screen, Givi Top Box & Pannier racks, Givi Maxia E52 & E22s, SW Motech Engine bars, Garmin Zumo 350. I'm from the side of the fence that likes a gear indicator. I put one on my Honda Blackbird because it was so smooth and free revving in the tight stuff you didn't know whether you were in 2nd or 4th, and like someone else said, you would ride for miles in 5th and forget to change up. I had no problems calibrating it. The only time it gets confused is if you pop the clutch and coast up to a set of lights; zero revs and 40km/h it can't work out. I have taken it off the Blackbird as it's for sale, and will keep it for my planned TDM. I just wish someone would make a 'You are now in top' indicator. 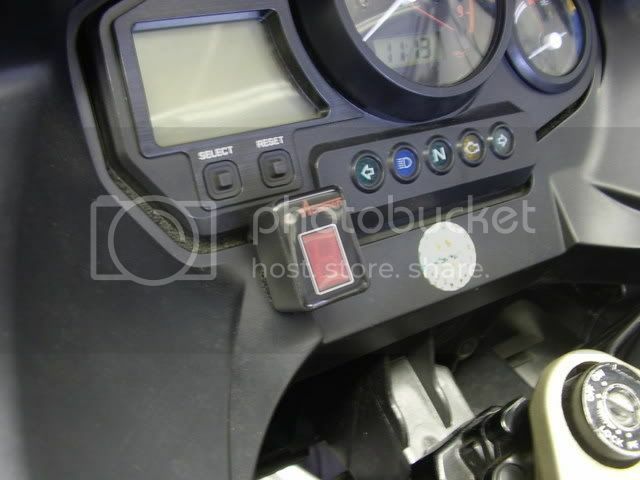 Some Yamaha's (eg 900 Divvies) have a gearshift which gives free travel when in 1st or top - therefore you can tell with your foot instantly whether another gear is still available without shutting the throttle or pulling the clutch. Admittedly, I reckon if I only ever rode the same bike it would be unnecessary, but I don't. Gear indicators seem to suffer from lag, but if the parameter was simply rpm in relation to roadspeed surely that can't be too complex to find top gears range and light an led? There should be tacho and speed signal too? I did the JBX gear indicator mod but for 6th gear only. Just one small green LED on the dash is all i need. Edited by SteveK, 01 March 2011 - 09:38 pm.